AKARTA, Indonesia (AP) — Attackers set off suicide bombs and exchanged gunfire outside a Starbucks cafe in Indonesia’s capital in a brazen assault Thursday that police said “imitated” the recent Paris attacks and was probably linked to the Islamic State group. All five attackers and a Canadian and an Indonesian died in the midmorning explosions and gunfire that were watched by office workers from high-rise buildings on Thamarin Street in Jakarta, not far from the presidential palace and the U.S. Embassy, police said. Another 19 people were injured. “We have identified all attackers … we can say that the attackers were affiliated with the ISIS group,” national police spokesman Maj. Gen. Anton Charilyan told reporters, referring to the Islamic State group. No one immediately claimed responsibility for the attacks. But the Aamaq news agency, which is affiliated with the Islamic State group, quoted an unnamed source as saying the group carried out the violence. The news agency has been used as a source on the IS militants in the past. 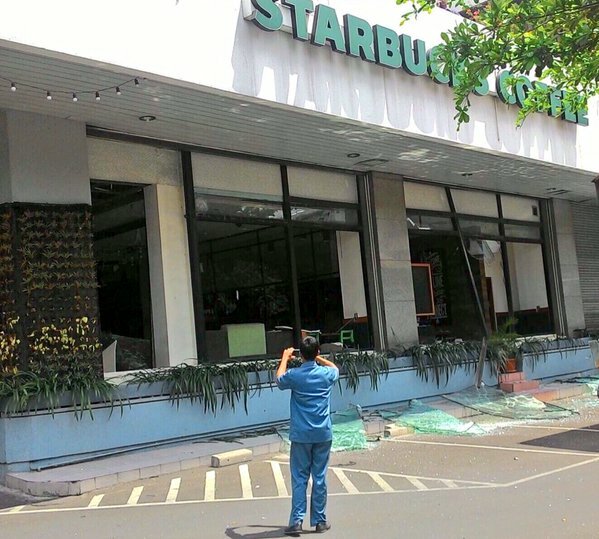 Jakarta police chief Maj. Gen. Tito Karnavian told a news conference that the first suicide bombing happened at a Starbucks restaurant, causing customers to run out. Outside, two gunmen opened fire, killing a Canadian and wounding an Indonesian, he said. “So we think … their plan was to attack people and follow it up with a larger explosion when more people gathered. But thank God it didn’t happen,” Charilyan said. He said the attackers imitated the recent “terror acts” in Paris and were likely from the Islamic State group, but gave no evidence. Karnavian also said the attackers had links with IS and were part of a group led by Bahrum Naim, an Indonesian militant who is now in Syria. It was the first major attack in Indonesia’s capital since the 2009 bombings of two hotels that killed seven people and injured more than 50. Before that, bombings at nightclubs on the resort island of Bali in 2002 killed 202 people, mostly foreigners. Thursday’s attack prompted a security lockdown in central Jakarta and enhanced checks all over the crowded city of 10 million. Thamarin Street is home to many luxury hotels, high-rise office buildings and embassies, including the French. Eliaz Warre, who witnessed the attack, said he was riding on a motorbike when the explosion went off at the police post. 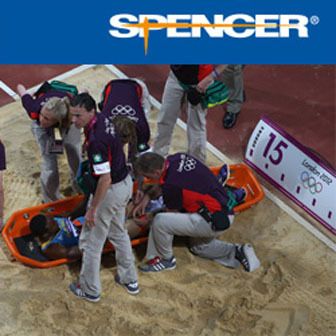 “I saw people running away and two people lying on the ground bleeding,” he said. Charilyan said police had received information in late November about a warning from the Islamic State group that “there will be a concert” in Indonesia, meaning an attack. “This act is clearly aimed at disturbing public order and spreading terror among people,” President Joko “Jokowi” Widodo said in a statement on television. “The state, the nation and the people should not be afraid of, and be defeated by, such terror acts,” he said. The country had been on high alert after authorities said they foiled a plot by Islamic militants to attack government officials, foreigners and others. About 150,000 police officers and soldiers were deployed on New Year’s Eve to guard churches, airports and other public places. Tweets from the account of Jeremy Douglas, Jakarta-based regional representative of the U.N. drugs office, described a bomb and “serious” exchanges of gunfire on the street outside his office. “Didn’t experience this in 3.5 years in #Pakistan,” he wrote. Indonesia, the world’s most populous Muslim nation, has suffered a spate of deadly attacks blamed on the Jemaah Islamiyah network in the past. But militant strikes in recent years have been smaller and less deadly, and have targeted government authorities, mainly police and anti-terrorism forces. A series of suicide attacks happens today in Jakarta, the capital of Indonesia. Six people have been killed by suicide bombings and some explosions. Anton Charliyan, a national police spokesman, said the death toll included 3 police officers and 3 civilians. 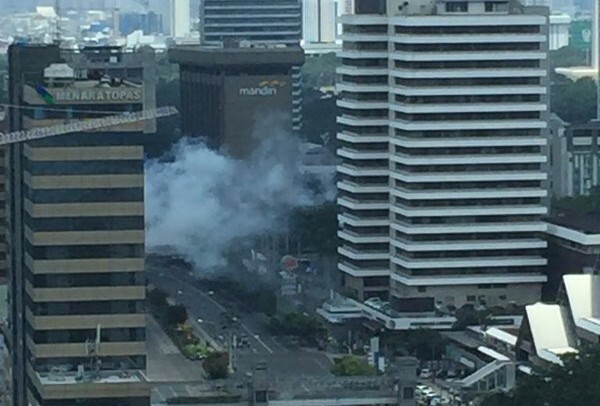 A series of multiple explosions have been reported from 10.30AM local time near the Starbucks at the crossroads of Thamrin Road and Wahid Haysim Street. At least one of the blasts occurred near United Nations headquarters on Thamrin Road. 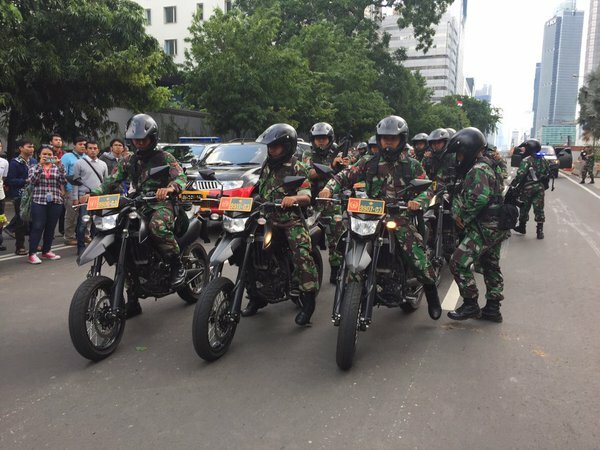 The Guardian reported that at least 14 gunmen, some on motorbikes, some wielding grenades, were involved in the attacks and around six are reportedly holed up inside the Skyline building on Thamrin Road. Armoured Personnel Vehicles have been deployed in the area.